Take a trip to ancient Egypt and earn the respect of Isis, the goddess of prosperity and fertility when you play this 5 reel online uk casino slot game with its lucrative progressive jackpot. 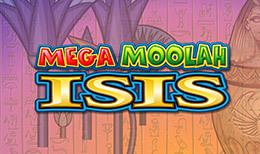 Spin your way through ancient and decaying relics to gain the trust and fortunes of Isis and indulge yourself in the wealth of free spins she will bestow on you. entertaining experiences of the bright and colourful side. (Mega Moolah Isis) scatter and wild symbols which take the shape of a hawk and isis respectively. Egypt that you never knew, one of piercing colours and even funner designs across the board. leave the gamble feature by hitting the “Collect” button to take their winnings.